Simple and affordable parking for all travellers. Start and finish your trip relaxed knowing your car is parked nearby. 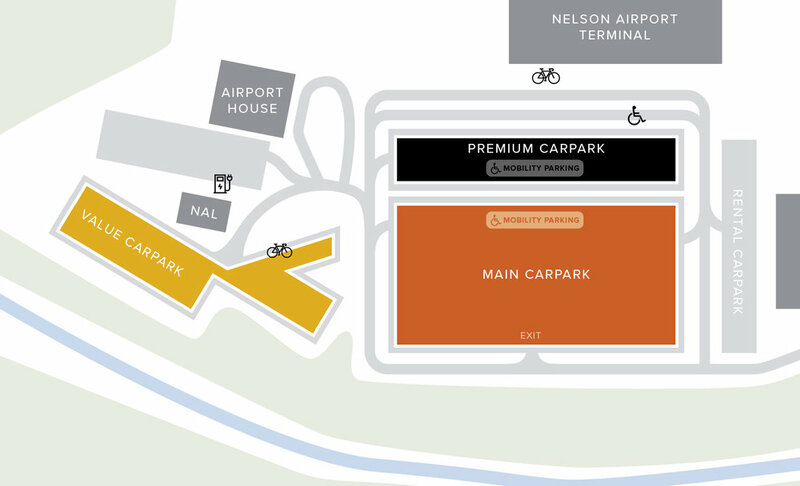 The perfect option for travellers wanting the convenience of parking at the airport, offering great value for a longer period. Stress-free parking options close to the terminal. If you’re popping away for a few days on business or on a well earned holiday, get off to an easy start with this parking option. Effortless parking that is comfortable & convenient. Our larger parks are conveniently situated directly in front of the terminal with easy access to the Check in & Regional Lounge. A designated area is located in front of the terminal forecourt for immediate drop off. Electric vehicle charging station (EV) there is an EV charging station situated in front of the Nelson Airport Offices (NAL). Please refer to the map. This park will be charged at the same rate as the Main Carpark. Mobility parks these are available in all parking zones including the drop off area. Please refer to the map for identified locations. *Please note customers who park in the Premium mobility car parks will be charged the same rate as the Main car park. Contact a Nelson Airport Customer Service team member to assist prior to exit. Bicycle parking is situated at the front of the terminal entry doors or under shelter at the entrance of the Value carpark. Car concierge you have the convenience of having your car serviced and groomed at Nelson Airport whilst you fly. Our technology offers you a number of convenient ways to pay and three great products to suit your needs. Enter using your Paywave card on the machine at the entry gate. If you choose one of our Value or Premium parking spaces, hold your card again at the entry barrier as you enter that parking zone. Exit the car park by using the same Paywave card used on entry. Hold card against Paywave reader for 5 seconds (until all of the lights go green) and instructed to remove it. The barrier will go up once you have taken your receipt. Enter the car park using your credit card by directly inserting it into the credit card slot on the ticket machine on entry. If you choose one of our Value or Premium parking spaces, insert your credit card at the entry barrier as you enter that parking zone. Exit the car park by inserting the same credit card used on entry into the credit card slot on the exit ticket machine at the barrier arm. You must leave the card in the slot until instructed to remove it. The barrier will only go up once you have taken your receipt. Enter by taking a ticket at the entry gate. If you choose one of our Value or Premium parking spaces, enter your ticket at the entry barrier as you enter that parking zone to lift the barrier arm. Pay at one of the pay machines located at the front of the terminal using, cash, eftpos or credit card. Exit the car park by inserting your validated ticket into the exit ticket machine at the barrier arm. The barrier will lift once it has recognised the validated ticket.